Cognac can be enjoyed in many ways: as a digestif or aperitif, straight or mixed with a little pure water, with ice or even in cocktails. Cognac and Pineau can even be used in cuisine as an ideal way to enrich the flavour of a dish and make sauces richer. Although the idea of the Cognac drinker sat in his armchair by the chimney, cigar in one hand, warming a glass of Cognac in the other has not yet disappeared, Cognac is now enjoyed in many other ways, by people from all walks of life. 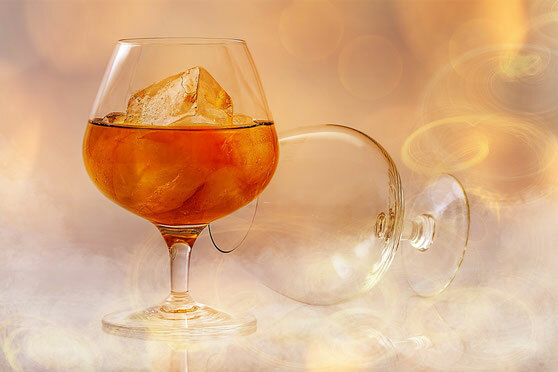 "Cognac on the rocks" has become a very popular aperitif. The ice softens the Cognac by chilling it, without diluting its flavour. The BNIC (Bureau National Interprofessionnel du Cognac) has even gone so far as to endorse this new style of consumption in an advertising campaign. By J-J Destrieux, from the Restaurant du château in Jarnac. * 2 measures of Cognac. Mix the ingredients together in a cocktail shaker and decorate the glass with a slice of orange and a strawberry. * 7,5 cl of Champagne brut. Put the Cognac and the grapefruit juice into a glass, top up with the Champagne. Created by Francine Pineau from the Restaurant du Golf in Saint-Brice. * sprig of mint . Mix all of the ingredients together, except the mint, and serve very chilled. Decorate the glass with the sprig of mint.